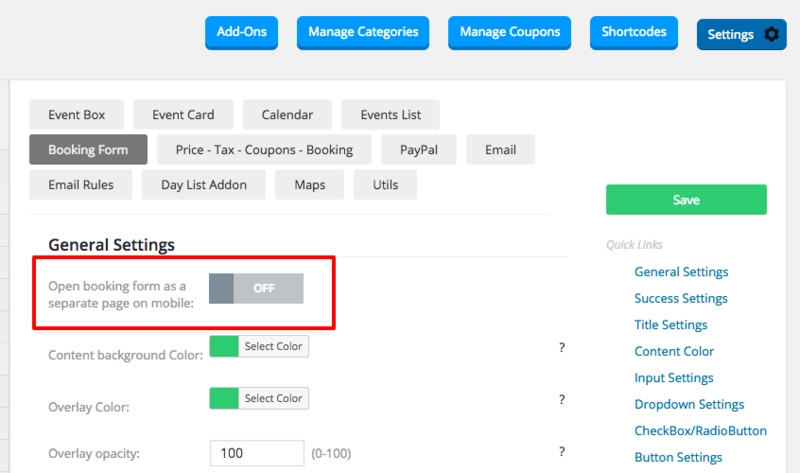 Same experience as on desktop browsers, a booking form will pop up above your current page. However, your theme might be too heavy and thus a popup on mobile might not be optimal. In this case, use mode 2. In this mode the user is redirected to a new page. The advantage of this that your website’s extra code wont work. Thus the experience will be much better. Downside, a redirect and not a popup. To use mode 2 set Open booking form as a separate page on mobile in Settings > Booking form tab to true. Prior to version 3.80 the default was mode 2. New option introduced in version 3.80.